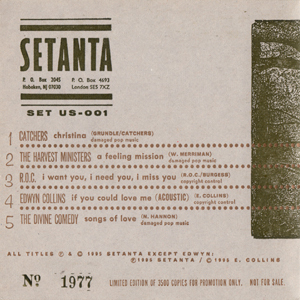 In 1995 Setanta Records launched their U.S. label, Setanta U.S. The label was hosted in Bar/None Records’ office, in Hoboken NJ, who also distributed the records. 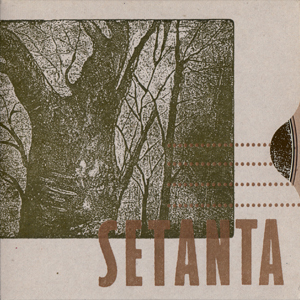 This Setanta sampler (SET US-001) was the first release by Setanta U.S. to promote Setanta’s bands. Only 3,500 copies of the disc were pressed, numbered and given away for free. However we don’t really know how it was made available to the public (via magazines? in record stores?). The cardboard sleeve is a well-crafted item, which was designed by Bruce Licher of Independent Project Press, a Californian printing company. The CD include Setanta’s biggest acts for the time including Edwyn Collins (who just had success with his Gorgeous George album), The Catchers and of course The Divine Comedy who were currently recording a new album. The Divine Comedy’s song is one of the songs from the new album: ‘Songs Of Love’ which was, at that time, only known as being the theme music from Father Ted. This version is sometimes said to be a demo version, but this is not really true. Although the Casanova sessions finished in early 1996, this version is the same take as the album version. This is the mix / mastering which is different. Indeed, the recording sounds lower; also both left and right channels are swapped. Although the CD was originally intended to an U.S. audience, it seems that it was also distributed to the UK audience, as a 1996 New Year sampler.